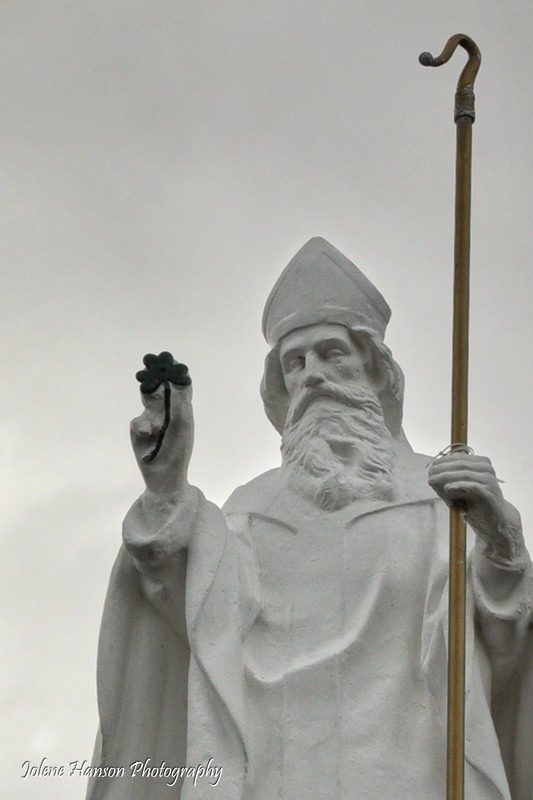 St. Patrick holds a clover, representing the holy trinity. The day I visited Croagh Patrick, Ireland’s most sacred mountain, clouds obscured its peak and tiny water droplets collected on my eyelashes. I hiked as far as the statue of St. Patrick, who overlooks the stunning waters of Clew Bay with a staff in one hand and three-leaf clover in the other. 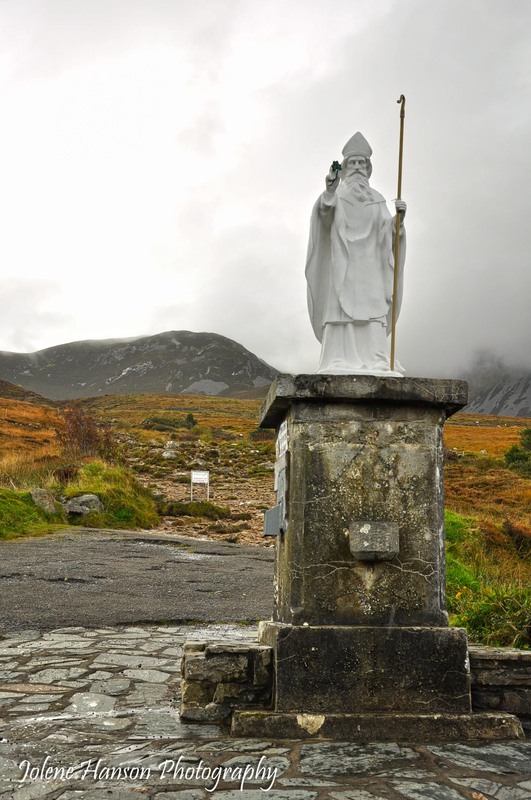 Had I continued past St. Patrick, up the mountain and into the clouds, I would have been following in the footsteps of thousands of pilgrims who came before me. I would have found a chapel at the peak, where many have sought redemption and offered prayers. I would have also been soaked from head to toe. October isn’t the most practical time for spiritual journeys up mountains. Most make the 2-hour trek on the last Sunday in July, known as “Reek Sunday”. This is a day in which Ireland’s patron saint is honored. 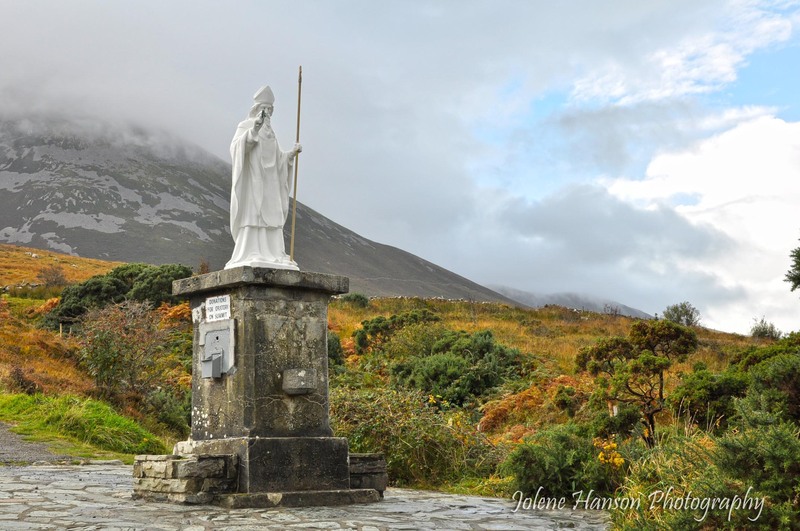 Legend has it that the “snakes” were driven from Ireland on Croagh Patrick. Perhaps that is why, when walking down the mountain and then driving back through Westport, just 5 short miles a way, I was overwhelmed with a sense of peace – almost as though something dark inside of me had just been driven out as well. I think that your dove-gray Saint must also have visited Bermuda, for no snakes slither in our verdant hills or, hither and thither, adorn the banks our radiant rills. The fog induces introspection, ideal for a pilgrimage (wet or dry). I love the first image. Wow! I have never been to Ireland. It has been on my bucket list. Now, your images and words are enticing me to pack my camera and buy an airline ticket. Thank you, Harold! I’ve been there three times now…and I feel like I should start getting to some of the other countries on MY bucket list. 🙂 But, It’s such an amazing country.